In preparation for Dying Light‘s upcoming DLC, Dying Light: The Following, developers are allowing fans to be involved in a very fun way. Within the new DLC, players will find themselves inside a postal office at a certain point in the game. Inside that post office will contain an assortment of scattered letters from survivors. Dying Light devs are allowing fans to send in their own letters for a chance to be included in that portion of the DLC. The letters must be in English and no more than 200 letters. 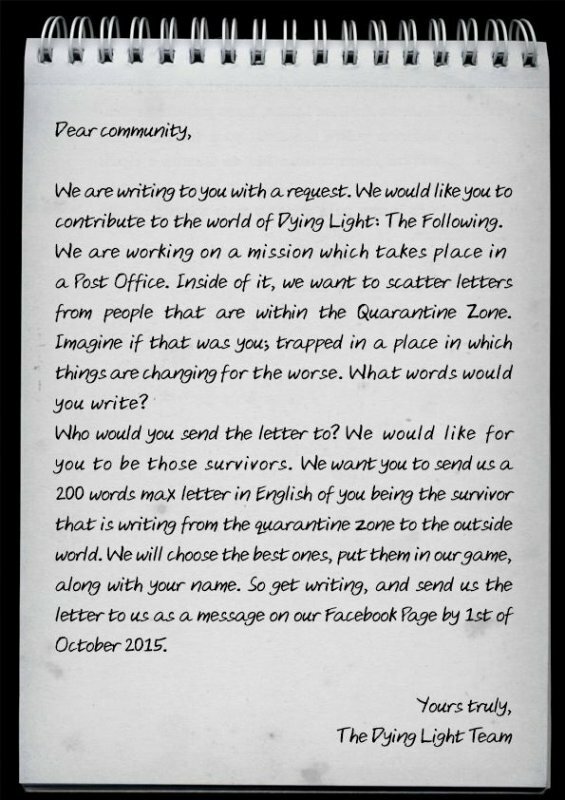 Entries must be sent as a message to Dying Light‘s Facebook page. Submissions are due by October 1st. For full rules and terms, click here.